A report by the Iraq Study Group has bluntly told U.S. President George Bush that his strategy in Iraq is not working. They've made dozens of recommendations which should help improve the situation. After nine months of interviews, research and visits to Iraq by the bipartisan Iraq Study Group, the panel made 79 recommendations including withdrawing U.S. troops, who not specifically dedicated to the training and support mission in Iraq, by the first quarter of 2008. The 142-page document, also recommends new and enhanced diplomatic efforts in the region, including talks with Iraq's neighbours Iran and Syria. 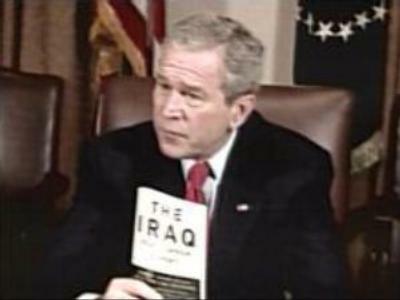 President Bush received the report at the White House at a meeting with the panels' members and said he will take the recommendations of the Iraq Study Group very seriously. But the President stopped short of saying he will follow their advice on policy changes in Iraq. In the past, President Bush has dismissed ideas that have become the basis for the Iraq Study Group's key recommendations. The Iraq Study Group says the war in Iraq has been a costly endeavour with $US 400 BLN already spent and costs are running at $US 8 BLN per month.